While summer is coming to an end here in the north light is coming back to Antarctica these days. Currently we are approaching the maximum sea ice extent until the raising sun will start melting the ice in October. Here are two assemblies of Landsat images from the northern parts of the Antarctic. The locations of both views can be seen in this map. 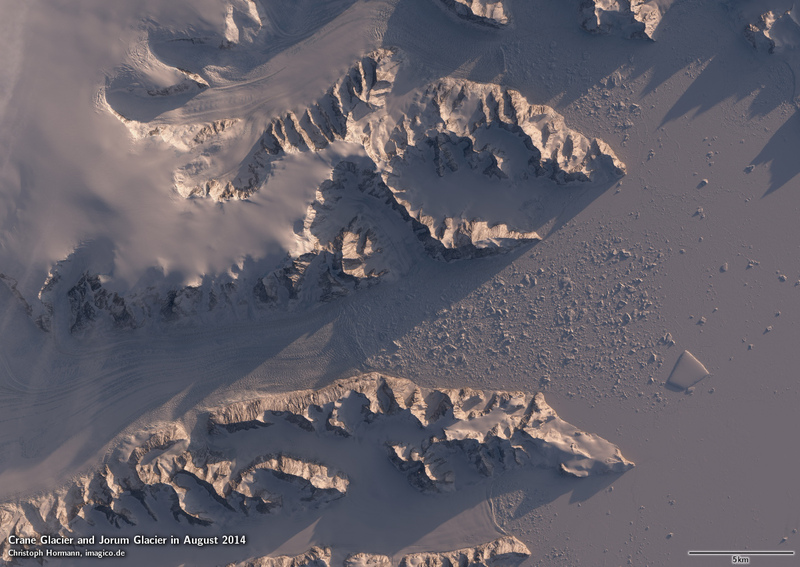 The Crane Glacier formerly fed the Larsen B ice shelf which mostly broke up in 2002. Since then summers mostly have been somewhat colder so the area formerly occupied by the ice shelf is now covered by multi year land fast ice which can be distinguished from the mobile pack ice from the Weddell Sea by the slightly brighter and more uniform color. Enclosed in the ice in front of the glacier and the smaller icebergs calved from it you can see a large kilometer sized piece of the former ice shelf. The third crop shows Robertson Island from the right side of the image, located at the edge of the fast ice area. The island is connected to the Antarctic peninsula by another reamining part of the ice shelf enclosed by various smaller islands. You can well see the different types of ice cover here. 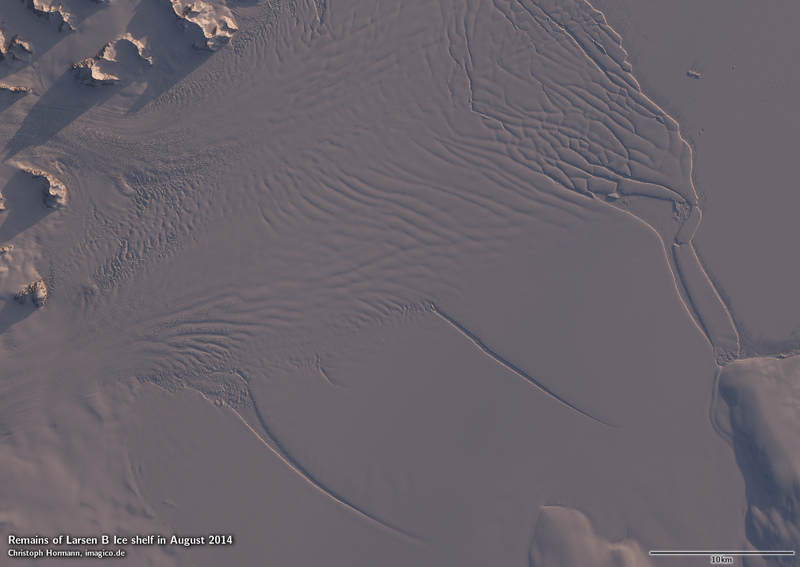 The thick ice shelf raises significantly higher above sea level creating a step at the edge well visible in the satellite image. The fast ice at the coast has a color similar to the ice shelf and is very smooth in general, interrupted by the enclosed icebergs and ice shelf fragments. The pack ice on the right of the crop is less uniform in color and in parts much darker indicating no or very thin snow cover on the ice. The air is so cold at this time of the year that cracks opening by the movement of the ice freeze over very quickly. This results in a complex pattern of ice of varying thickness and varying amounts of snow cover. 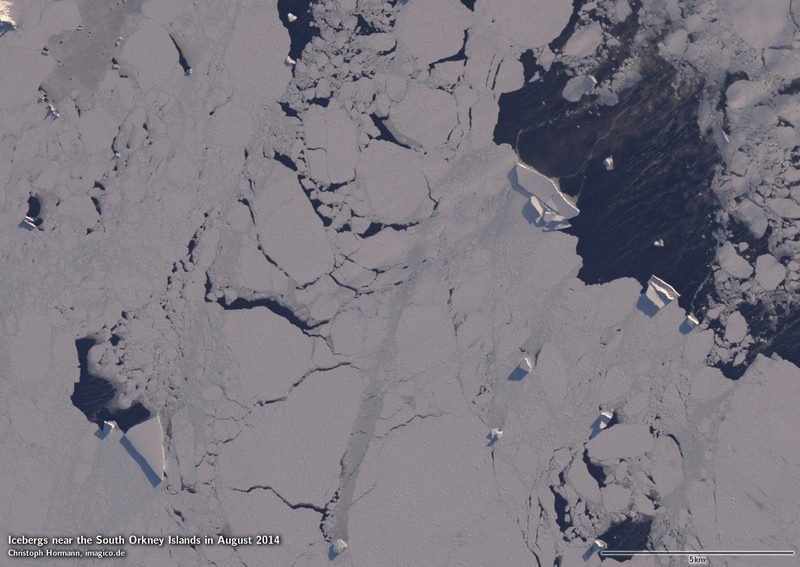 At a close look you can also see that the ice shelf fragments visible are generally much thicker than the ice shelf area west of Robertson Island seems to be. Ice shelf thickness varies greatly depending on the weight of the four different mechanisms described above. The ice shelf in this area receives only little input from glaciers and is mostly built by local accumulation of snow and freezing of sea water. The thicker ice shelf fragments originate from areas with more inflow from glaciers building up a thicker plate of ice. The second view shows the South Orkney Islands at the northern side of the Weddell Sea. The largest islands is Coronation Island on the left. It is mostly covered by glaciers with only some mountain ridges and coastal areas being free of ice. 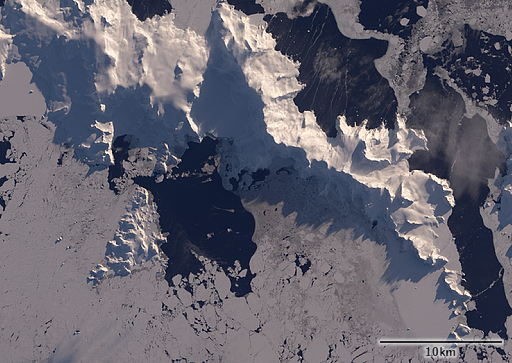 Visible on the right is Laurie Island, between the two Powell Island and south of Coronation Island Signy Island which has larger ice free areas and is one of the few areas in the Antarctic with notable vegetation. The following crop shows it and the eastern part of Coronation Island. 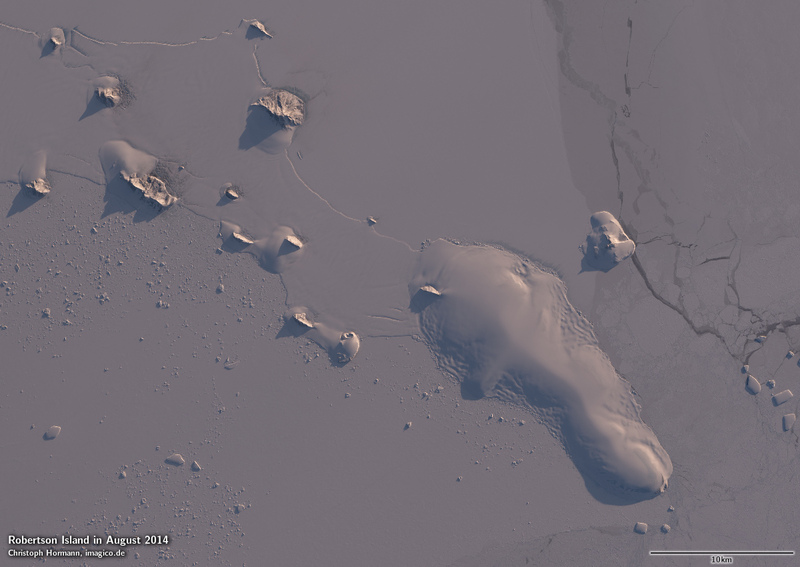 The sea around the islands is mostly ice covered with various icebergs. 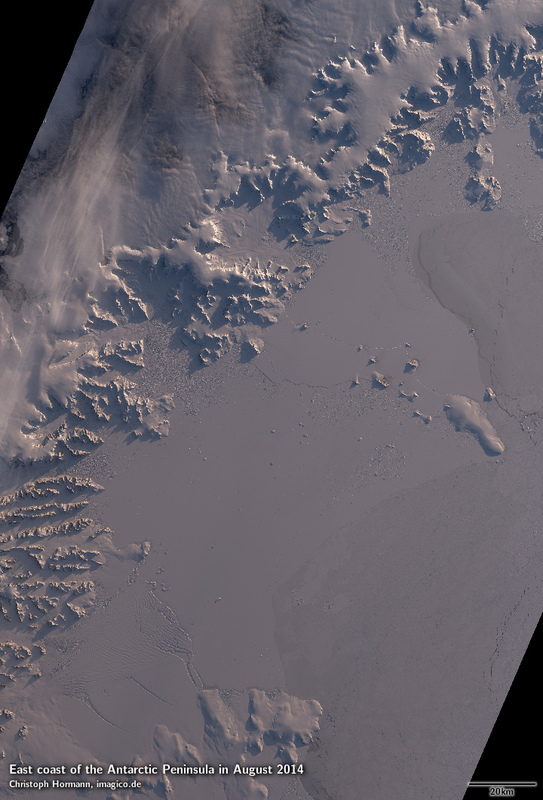 On the lower right of the view you can also see some large tabular icebergs that clearly do not originate from the glaciers on the islands but from mainland Antarctica and have been transported here across more than 1000 km by the ocean currents.